Hi ! I've been sorting through my Spellbinder Dies and re-discovered some that I have not used in awhile. 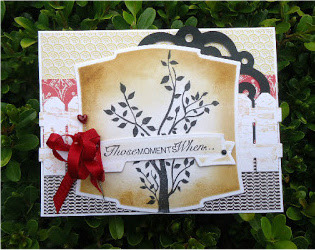 I found they are a perfect companion to my Rubber Cafe' Tree Silhouette stamp and our On the Fence die. I thought this card could be used for Sympathy, Friendship, or any type of encouragement. They are the ones I never seem to have enough of. 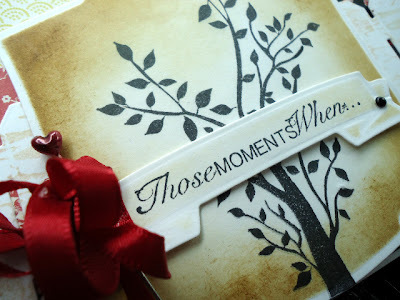 For my sentiment, I used "Those Moments When..." from our Remember the Moments, Stamp set - and after diecutting my fence out of our White Pugnacious paper, I stamped it using the background Woodgrain Stamp with Antique Linen Distress Ink. I cut, embossed and inked around my Tree Silhouette with the Labels Two Nestibilities dies from Spellbinders. This is the largest one from the set, but by leaving my die on my stamped image and inking it with Antique Linen, and Vintage Photo, it left me with a nice crisp white border. The black doily you see poking out in back is not a diecut, it is a purchased Doily! 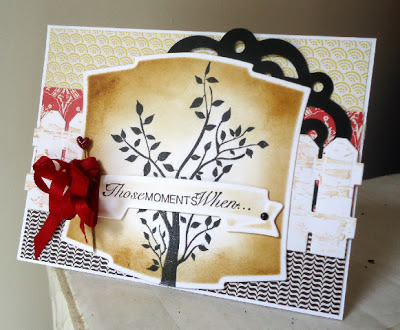 I used the Spellbinders Ribbon Banner Die to showecase my sentiment- lightly inking this as well, and adding two small black brads on each end to anchor it. I tied and crimpled up a ribbon bow in red 1/4" satin, and added a small heart stick pin for more color. I love how this turned out - and it really would be simple to make more of these using this card sketch and feature any simple silhouette type stamp, which I also just love! 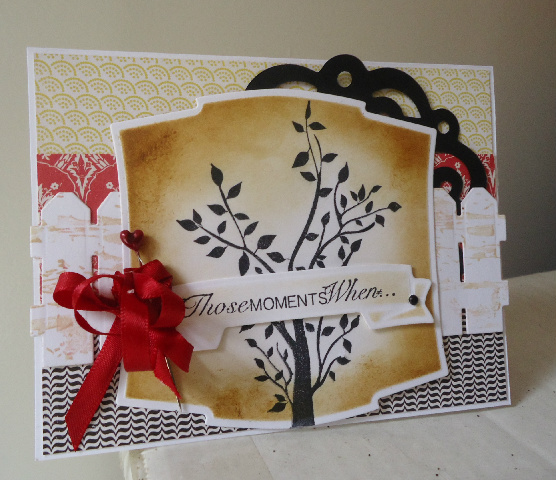 Love the layers and you used the new stamps. So pretty. Love that ribbon too! very pretty! That woodgrain stamp looks awesome on the fencing.